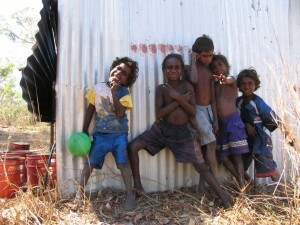 Many Yolŋu parents desperately want their children to get a good education. But they have few options. The current mainstream schooling system offers them little real hope despite many trying. Lack of culturally appropriate educational environments leave many Yolŋu students traumatised and/or struggling to learn. This system destroys both the teachers’ and the students’ potential. To solve the problem we could train teachers in Indigenous language and good cultural competency and communication skills. Despite the massive saving to government budgets and great outcomes that would produce no one seems to want to do this. Another solution, which Why Warriors has been wanting to develop over the last 10 years now, is an online school. A Yolŋu school that, once developed, can go on delivering genuinely effective Yolŋu friendly education for many decades. This would bring the full power of Yolŋu language and culture into play, putting Yolŋu children in an appropriate and safe learning environment. It could be used by Yolŋu parents and Elders as a self-learning resource, or by mainstream schools to turbocharge the classroom education. Yolŋu students of all ages would learn how to read and write in both their original Australian language (Yolŋu Matha) and English. All instruction would be Yolŋu Matha so the student has full understanding in their first language, allowing proper cognitive engagement. It would also teach maths, world history and science – in Yolŋu Matha and English – through to university level. It will be a tool through which Yolŋu communities can control and drive their learning experience, combining the best of traditional and contemporary knowledge. “Djambatj marram” means to “skill yourself up” or get trained. This new site offers the opportunity to gain both basic and advanced knowledge across a whole range of subjects that fill the information gaps and clears the smoke on the confusion that contributes to the marginalisation of Yolŋu communities. This is a game changer for Yolŋu! The development of the site was funded by the Department of the Prime Minister and Cabinet and currently focuses mainly on education regarding economic and business development challenges as well as achieving improved general English literacy. We have also added some programs recorded many years ago on important health subjects. Djamabatjmarram.com is in its early stages and translations of the written content to Yolŋu Matha are still being improved, as is functionality. But the site is up and running so Yolŋu can make the most of the content as soon as possible. Feel free to check it out and share widely, especially with your Yolŋu friends. We think it will be as popular as our original pilot literacy learning portal back in 2012 demonstrated. When this platform was trialled with Yolŋu the uptake was phenomenal, with young teenagers fighting to get access to the computers it was installed on. 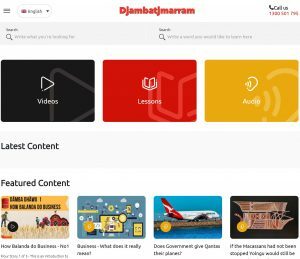 Djambatjmarram.com provides a whole range of new content, plus the old content, in a more user-friendly way. But the vision for a complete online Yolŋu School that gives 10,000 + Yolŋu access to real learning opportunities is far from complete. The long-term funding to staff its development is still needed. Why Warriors on behalf of many Yolŋu parents and leaders are looking for private partners to help us build this online Yolŋu School. Want to make a real difference to Yolŋu education? Please contact us now.